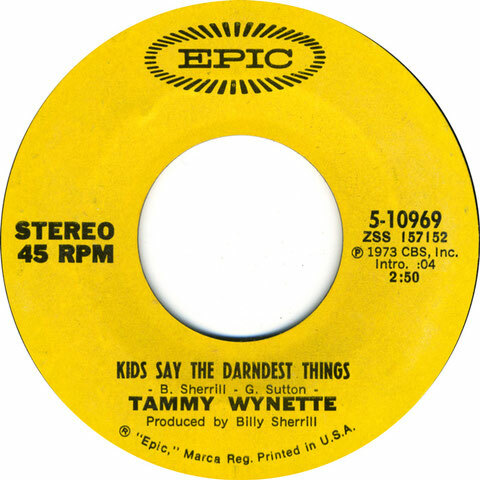 "Kids Say the Darndest Things" is a song written by Billy Sherrill and Glenn Sutton, and recorded by American country music artist Tammy Wynette. It was released in March 1973 as the first single and title track from the album Kids Say the Darndest Things. It was Wynette's thirteenth number one on the U.S. country singles chart, staying at number one for a single week and spending a total of thirteen weeks on the chart. In the song, the narrator reveals her marital problems, by way of innocent comments her small children repeat, which they'd overheard their parents make ("My four-year old said 'I want a divorce', now where did she hear that"). Or the little songs they sing? My four year old said: "I want to divorce." Now where did she hear that? Our one rushed through the door. "Don't you call me here no more." 'Cause she cried all night long." Or what they're thinking of. And it sure wasn't love.